Haughton home for sale in Forrest Hills. 1713 Turning Leaf is new to the Market. This Haughton home is 2205 sq ft and priced at $269,900. HHG is eager to get this listing out and SOLD. This home is on a half acre, and has 4 bedrooms 2 baths. From the outside as well as inside, this home is gorgeous. All brick exterior with wooden doors and wood shudders. Once inside you will find a pretty open floor plan. Walking into the living area the first thing you see is the brick fire place. Then you can go into the amazing kitchen. There is thick granite counter tops, and great appliances ready for some home cooking. There is wood flooring throughout except in bedrooms. 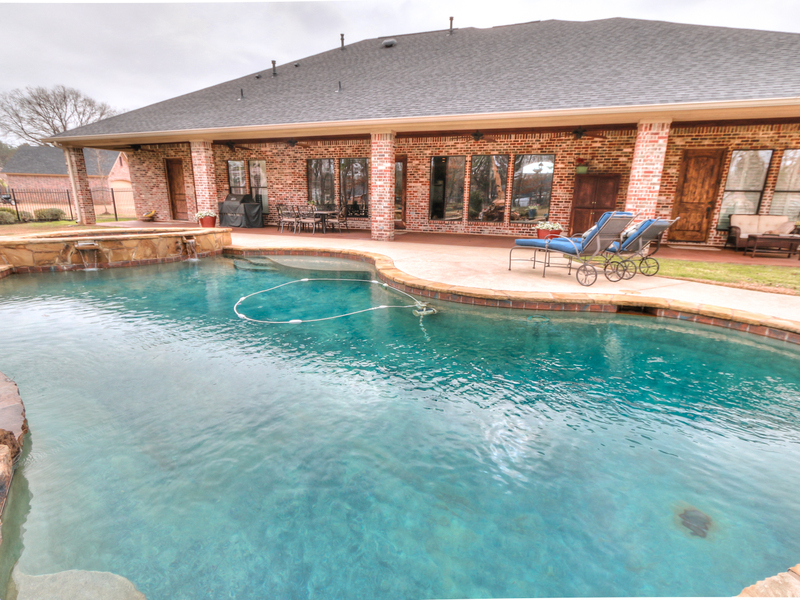 This Haughton home has a great backyard and a great pool ready for Summer. The back yard itself is so huge. If you have children or pets this backyard id perfect. Come check out this listing for yourself. We want to show it to you today!! This Shreveport home is move in ready and located near Mansfield Rd. 4 bedrooms 2 bath this 2240 sq ft home is going for 185,000. What a deal!! When you walk outside you will walk down the walk way to the amazing in ground pool. 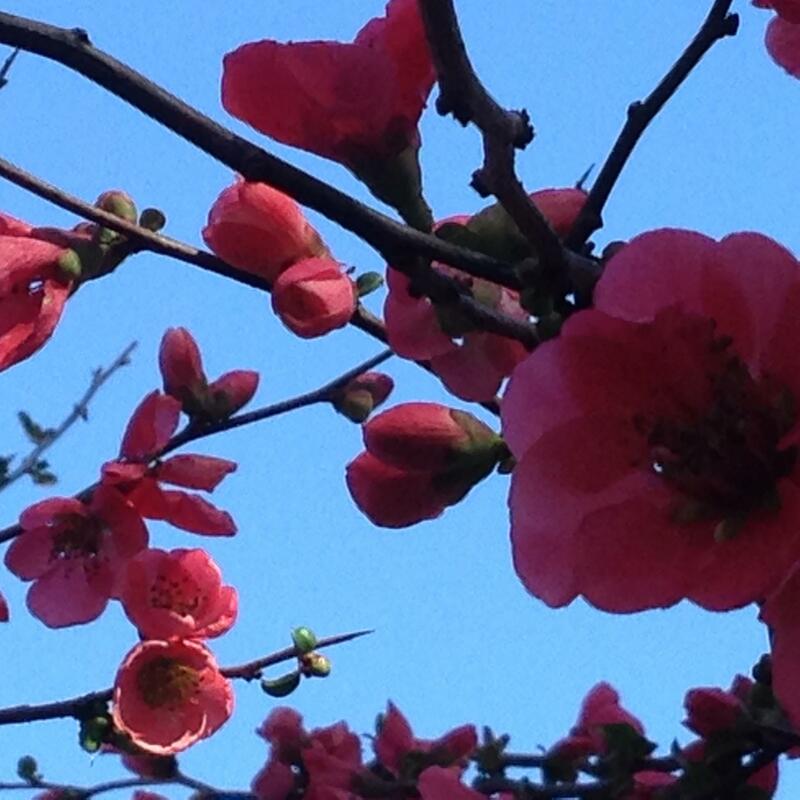 It’s almost Summer to! How perfect to buy a home with a pool right as Summer is approaching. HHG just listed this home and we are eager to get the word out to everyone and show show show!! Bring the offers! 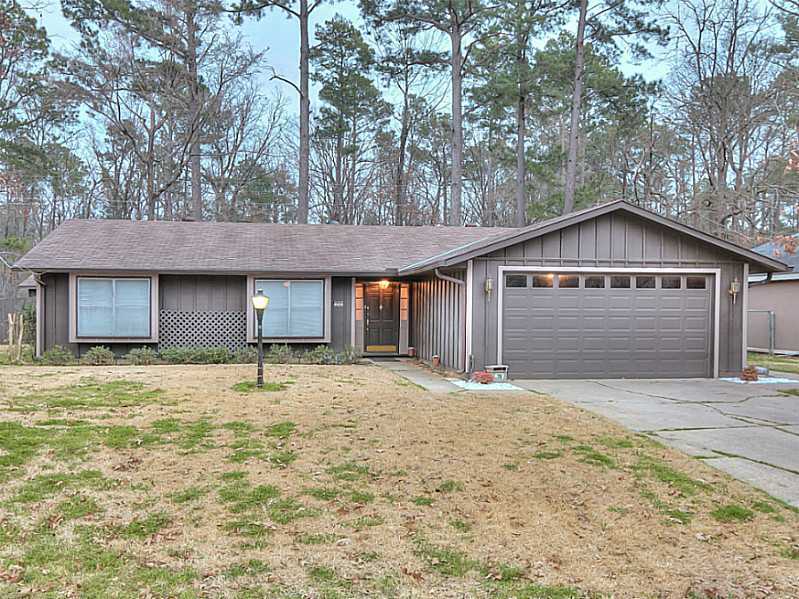 This home was built in 1979, the outside is brick, and it has a great front yard. There is a huge shade tree in the front yard to keep most of the sun off. This home is currently vacant, the sellers have move out, cleaned out and put the word out to get this home sold. Now it is HHG’s turn to market and we are so excited! Let us know if you would like more info about this Shreveport home for sale by text, call, or email. On March 19, 2014 HHG closed a home for sale in Shreveport. This home was on the market for about 2 weeks when our buyer’s agent Bobbie Hebeisen brought an offer to Chris Hayes Team. This family was such a blessing to work with. Everything went very smoothly throughout the closing process. Once we got the offer accepted by Chris Hayes Team, we sent the paperwork over to our escrow coordinator. From there the Title work was completed by M&M Title, and Ulysses at Barksdale Federal Credit Union helped our client with their conventional loan. On this transaction the sellers paid closing costs and paid for the home warranty. This Shreveport Home is located at 8934 Marlow. It’s 3 bedrooms 2 bath, and 1711 sq ft. It was bought for 125,000. This is a family of three. 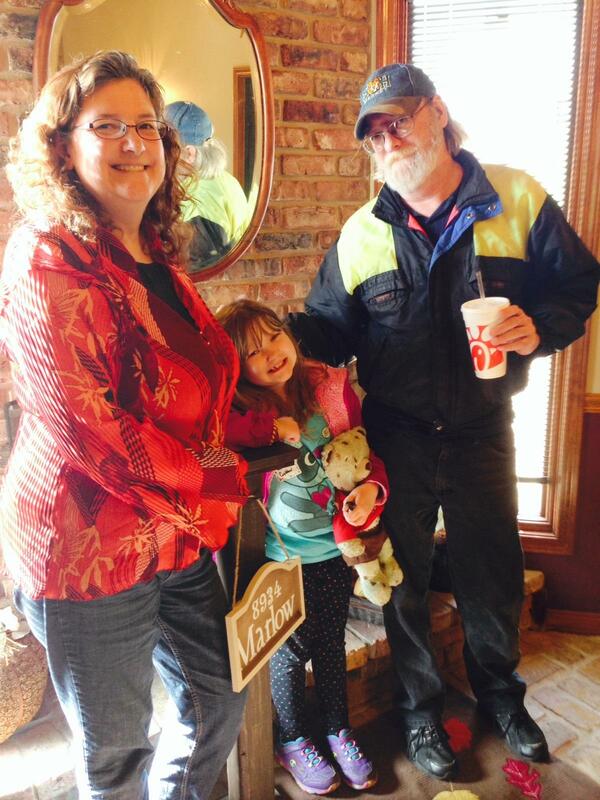 Ms. Vieth, her boyfriend, and daughter. They are ready to move into their new home!! HHG is so excited for them. Than you guys for letting HHG help you fulfill your dream of buying a new home. Another Perfect Home Found in Shreveport!! Shreveport couple has found their new home, just in time because they have a baby coming in about 1 month! How excited HHG is for them two new great things happening in their life, and perfect timing. This home is located in South Shreveport, Ellerbe Road area. Perfect location for the Kremeiers. HHG is thankful to have been a part of this amazing step in their lives. Starting off Bobbie (HHG’s buyers agent) and the Kremeier set of looking for a home. They found this South Shreveport home and decided to go for it. It was FSBO so Bobbie and the sellers started their negotiation process. Once agreed upon, and having been pre-qualified by Chase for a conventional loan the process was on a roll. First Commerce Title handled the Title work, Chris K from One Step Above did the inspection, and once again Chase was the Lender. This deal went well, we are so happy for them. The sale price was reasonable at $113,400 setting the monthly payment at an affordable $594 per month. New home, new baby, could things be better? Congratulations to Mr. and Mrs. Kremeier and baby Kremeier, also congrats to Bobbie Hebeisen, and HUGE thank you to all who helped make this sale so wonderful. What a success on this all cash deal HHG has made! This is an amazing Shreveport home. It has been viewed over and over again with no negative remarks. We got a cash offer that was accepted by the Seller after some consideration and from there we let Bayou Title cover the Title work and got the ball rolling. This closing was quick, smooth and easy. This home was sold for $465,000 cash, and is 4101 sq ft. There are a few features that we wanted to point out on this home that makes it special. First in the living area there are 6 windows. 3 on top and 3 on bottom going all the way up the wall. The ceiling is very high in the living area as well because of the 2nd story. The kitchen in the home is amazing, there is a hearth room and a theater room that’s fully wired. How fun! We want to congratulate Dr. and Mrs. Teagle on the sale of their home. Good luck with everything in your bright future. Remember use Holloway when you can’t find your way! Watch out market 5254 Danton is for sale. This home is spectacular. There are so many features to list for just this home its unbelievable. First lets take a minute to talk about the home specs. 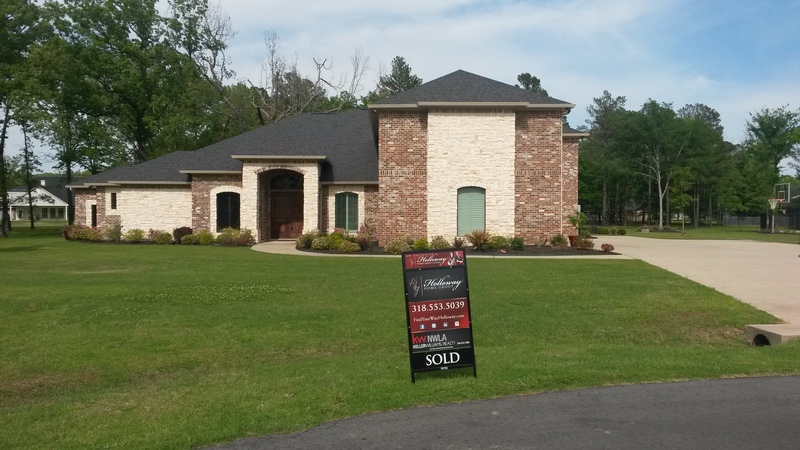 This Shreveport home is 4823 sq ft and is priced at $599,900. It is located in the gates community of Fountainbleau Estates, there are HOA fees here, they are $200 a year. Built in 2008 this home has been very well maintained. The from is complete with beautiful stone brick facade. The exterior is all brick and tile around the pool/hot tub. 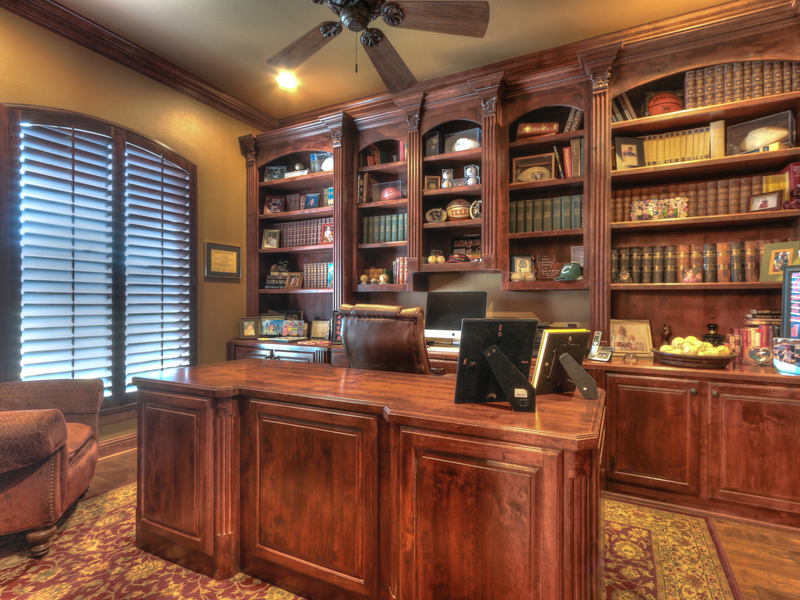 Once inside you will see an amazing home office to your left with built in shelving and an office desk that will reside at the home. Across you will enter the breakfast room where your family can enjoy some quality time. Next you have the immaculate kitchen perfect for any in home chef’s out there. All appliances are commercial grade stainless steel. The counter tops are all thick granite, including the center island which has its own built in sink. Under the 6 burner stove there is a food warmer to keep fully cooked food warm until dinner. Also there is a wine cooler separate from the fridge to store all of your wine. In the home there are 3 master bedrooms complete with their own baths. In the master bath suite you will find his/hers separate vanities, double entry showers with double faucets. All tile in shower with wall spouts on her side. Right off of the master bath suite there is a work out room. You can literally work out and enjoy watching TV on the built in TV screen, or look outside through the window, and then jump straight into the shower! Upstairs you will find a full bedroom/bathroom, 2 closets in game room, and a completely done theater room that equipment stays in. Projector, decor, and recline chairs stay in the home with purchase. What a deal!! If that isn’t enough you can go outside to find an amazing full home length patio with entrances from the living room, and master bedroom. The pool is all brick and attached to the hot tub. There is also a beautiful brick fountain, and the lounge chairs will also stay with the home. There are so many things to describe at this home that you will just have to come see for yourself. We can’t wait to show you, give us a call!! Click above to see Features listed. Closing Closing … Read All About It!! A few months back Bobbie Hebeisen, Holloway Home Group’s buyer agent, received a phone call from the Rico’s. They saw a property in Blanchard that they wanted to see. That property did not however work out for them. So HHG worked with them for a few months until we finally showed them a property that they were ready to put an offer on. This property just so happened to be in Dogwood Subdivision in Haughton. They found the perfect new home to move into. It is a 3 bedroom 2 bath, 1583 sq ft, and sold for $165,000.00. First HHG sent the offer to the listing agent, once it was accepted we immediately sent it to United Title Ashley Ridge to start Title work. Cobalt gave this couple a Rural Development – USDA Loan. This process went quick and smoothly. We are proud to say we were a part of this journey for the Rico’s. We got the sellers to pay closing costs for this transaction. All in all this was a win win transaction and that’s what everyone wants! 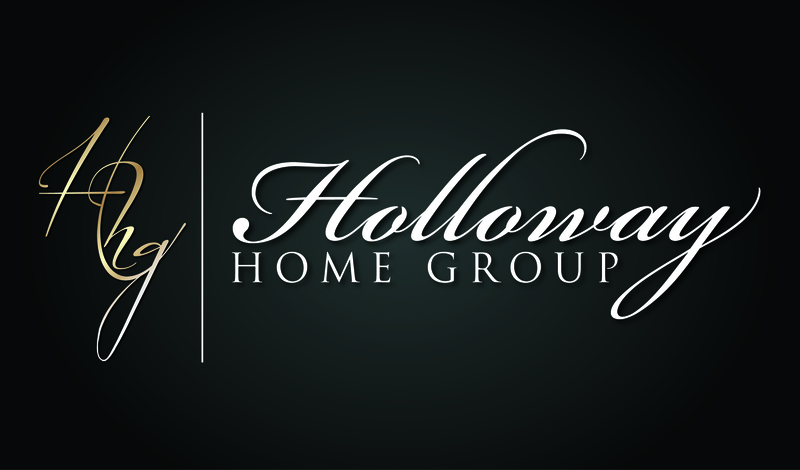 Let Holloway Home Group help you with all of your buyer/seller needs. Call us or email us and we will gladly assist you. This lovely Haughton home in located in Country Place Subdivision. This home is a great for first time home buyers, or a family looking for more space and storage. This 3 bedroom 2 bath is 1719 sq ft, and has a wood burning fire place. When you walk out to the back porch you will see that it is screened in, and the back yard is rather large. The master bedroom is a sight to see with his/her walk in closets, master bath has garden tub and a stall shower. This Haughton home has a community pool, pond and tennis court. There is also a security system and an integrated system. Haughton LA is full of things to keep you busy. There are many stores and restaurants for you and your family to enjoy. There is also near by schools if you have children that will be attending grade school. Haughton is not far at all from Bossier, and all the many shops and events that it offers. This home won’t be on the market long so come see while you can. Just contact Holloway HOme Group for all you buying/selling needs. We will be happy to assist you.